In stock -This product will ship today if ordered within the next 1 hours and 40 minutes. A unique combination of ingredients; glucosamine sulphate, vitamins C and E, this makes an ideal supplement for dogs and cats. Glucosamine Sulphate 2KCI (from shellfish), Yeast, Vitamin C (as Calcium Ascorbate), Vitamin E (as dl-alpha Tocopherol), Beef Flavour, Stearic Acid, Silicon Dioxide, Magnesium Stearate. For best results tablets should be added whole or crumbled into moist food and then mixed in well. A bowl of fresh water should always be available. 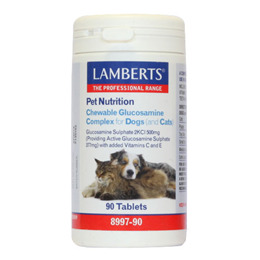 Below are reviews of LAMBERTS Glucosamine Complex for Dogs and Cats - 90 Tabs by bodykind customers. If you have tried this product we'd love to hear what you think so please leave a review.